Ukiah-Dale Forest State Scenic Corridor along Highway 395 follows the North Fork of the John Day River and Camas Creek. Winding through a stately ponderosa pine, Douglas fir and western larch forest the corridor provides a pleasant scenic drive and access to a popular fishing spot. Near Ukiah, amidst old-growth pines and larch, the Ukiah-Dale Campground provides a perfect location to stay and relax next to the soothing waters of Camas Creek. Spring brings an abundance of wildflowers -- including camas, a traditionally important food source for the native Americans. 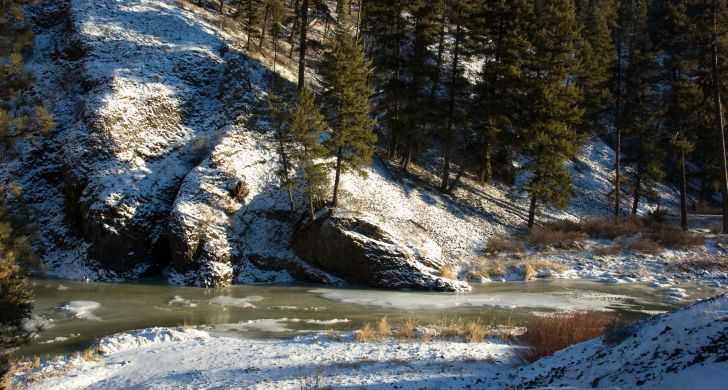 Camas Creek and the John Day River offer anglers excellent fishing for trout, steelhead and salmon.The Bridge Creek Elk Wildlife Area is nearby, providing hunters with plenty of big game hunting opportunities. The surrounding national forest provides an abundance of mushrooms and berries. Quiet, relaxing and far from the high-speed demands of metropolitan life, Ukiah-Dale can provide you with a wonderfully relaxed feeling. In the nearby town of Ukiah, re-stock your groceries, gasoline or fishing tackle. Take a break and discover this unique hideaway.